Here's a list ov good herbs n plants for us, wot dey called and wot dey do. Settle down now and stop yer nibbling an yapping, dis impawtunt. I wud juz like to say dat me not responsible for wots wrote in dis page, and dat yoor hoomans shud always check furst before dey pick wild fings and herbs to give us, because some may not be da herb dey fink it is, and it cud be harmful to us. So tell dem to be rilly careful, check and double check on Google for pics of desired herb and make sure dey picked da rite one. Also if we iz on medication to check wiv da vet to make sure it safe to give us herb ontop ov medication from vet. Sometimes da two not mix very well. Rilly dey gotta use a bit ov common sense, we knows dey not always got any but wiv our guidance hopefully dey look after us propply. So me pals, here's da good herbs and fings and what dey help wiv and dosage and ovver stuff, and wot to do wiv dem. * Good for puppy growth. The plant alfalfa is rich in protein and minerals (such as calcium, copper, folate, iron, magnesium, manganese, phosphorous, potassium, silicon and zinc). In addition, it contains vitamins A, B1, B12, C, D, E, and K. As such, it is considered nutritive. Alfalfa also has diuretic, antioxidant and anti-inflammatory properties - these therapeutic properties are often used by holistic vets to help dogs with inflammatory diseases, such as arthritis, bladder irritation, and even cancer. The herb alfalfa is widely available at health food stores in the forms of capsules or liquid extract. The bulk powdered dried herb is also available at health food stores. This herb is one of the best for dog arthritis and gout. Recommended dosage is 1/2 teaspoon powdered herb daily for small dogs; 1 teaspoon daily for medium dogs; and 2 teaspoons daily for large dogs. For Anemic Dogs: Alfalfa has a high Vitamin K content and is beneficial in remedying bleeding disorders which result from long-term use of allopathic drugs such as antibiotics. It helps with anemia and dizziness caused by a lack of blood flow. (Caution, however, should be taken as Vitamin K has been linked to cases of Heinz-body anemia in dogs (and cats) when taken in large quantity.) Recommended dosage is 1/2 teaspoon powdered herb daily for small dogs; 2/3 teaspoon daily for medium dogs; and 1 teaspoon daily for large dogs. 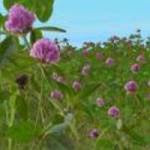 Alfalfa is often used by holistic vets as a tonic for the blood. With healthier blood and better circulation, skin condition improves. Recommended dosage is 1/4 teaspoon of powdered herb daily for small dogs; 1/2 teaspoon daily for medium dogs; and 3/4 teaspoon daily for large dogs. Thanks to its trace minerals and rich digestive enzymes, alfalfa benefits dogs with poor appetite, gas and sluggish digestion. Recommended dosage is the same as for dogs with dry skin. For Dogs with Problems in the Urinary Tract System: Alfalfa is helpful to the kidney in general and is good for treating bladder irritation due to overly acidic urine due to its alkalinizing effect. Recommended dosage is the same as for older dogs. For Cancer Prevention: Due to its anti-inflammatory properties, alfalfa is also good for cancer prevention. Use the same dosage as for older dogs. Aloe vera is very easy to grow indoors in all climates and outdoors in warm weather. In hot summer days, make sure that the plant is not directly in the scorching sun. Indirect light is the best. The main constitutents of this herb are amino acids and minerals (calcium, folate, iron, magnesium, phosphorous, potassium and zinc), as well as vitamins A, C and E.
Aloe vera has a lot of therapeutic properties, including anti-bacterial, anti-inflammatory, antioxidant, anti-allergy, and even anti-cancer. It also soothes skin irritations and heals wounds. The fresh juice or commercially prepared gel of aloe can be applied to irritated skins caused by such skin problems as hot spots, eczema, mange, and lupus to relieve the intense itching. It also brings immediate relief to fleabites and poison ivy, and reduces the itch on wounds after surgery. If your young pup has acnes on the skin, try this herb! The gel-like juice cools and soothes the skin and helps kill bacteria. You can apply aloe vera gel on your puppy's acne several times a day after washing her face. Again, make use of the soothing property of aloe's gel to treat sunburn on your dog's skin. If you have an aloe plant, just break off a leaf and squeeze out the gel. Spread the gel on your dog's sunburned sore spots. Of course, you can also get an aloe cream and use as instructed on the label. The soothing aloe gel can also be used to relieve teething pain in puppies. Freeze some aloe vera juice in a small paper cup. Once it is frozen, you can peel back the paper cup and rub the frozen juice on the puppy's gums. This will soothe the discomfort in the gums, and will numb the pain almost immediately. Wound Dressing: Aloe is commonly used as a topical skin dressing for curing minor burns and wounds. The juice/gel can be applied, once or twice daily, to lightly cover the wound. Allow it to dry and let it stay on as long as possible. Internally, the chemical compounds found in the herb are found to have antioxidant and anticancer actions in the body. The juice can be given to dogs as a general tonic (up to 1 tablespoon per 10 pounds of body weight). It can also be used to detoxify the body and many dog parents also add the juice to their dogs' drinking water to prevent cancer, or as a complementary cancer "remedy". However, if you do decide to give this herb to your dog internally, be sure to look for a product that uses organically grown aloe vera (like this one). Also, make sure that the product is free of artificial colors and flavors, as well as other questionable ingredients such as sugar, corn syrup, etc. Also, stay away from products that are "whole leaf" preparations, which contain the outer rind, which is laxative. This gel is great for eczema and itchy skin caused by insect bites, dry skin and parasites. Mix the oils in the aloe vera gel. Apply to irritated areas. Burdock is nutritive and contains minerals such as calcium, phosphorous, and iron, as well as B vitamins (e.g. thiamine, riboflavin), and inulin. It is a diuretic and has antioxidant and blood cleansing properties. It also stimulates the liver and the gallbladder. In Japan, burdock is called Gobo and the roots are available at supermarkets. People readily incorporate the roots in their daily diets: they put them in soups, pickles, and vegetable dishes. The taste is quite good, and my dog eats the roots (cooked) with no complaints! If you cannot find fresh burdock roots in your part of the world, you can always use dried root to make a decoction (see below) or buy an alcohol-free tincture, which can be mixed in with the dog's food. Burdock is a highly effective herb for the detoxification of the body. Its chemical constituents can remove toxic substances that are increasingly threatening the health of our dogs. This herb enhances liver health and can be used as a long-term nutritive liver tonic to clean and build the blood. In particular, if you have an older dog, it is good to give this herb to your dog for liver support. Dogs with kidney and bladder diseases resulting from poor waste elimination can also benefit from this herb, which has diuretic action that helps to eliminate waste materials from the body. urdock helps balance blood sugar, so it is useful for dogs with diabetes. Burdock has anti-inflammatory properties; therefore it is useful in the treatment of arthritis and rheumatoid disorders. Burdock root is effective in treating chronic or acute psoriasis, mange, and eczema. It can also treat flaky, oily, or inflammatory skin disorders as a result of an overload of toxic substances in the body. One of burdock's main constituents, inulin, is anti-inflammatory and helps correct imbalances of the immune system. Therefore, it is useful for treatment of cancer (which, to put it very simply, is caused by chronic inflammation and a weakened immune system). In fact, this herb is one of the key ingredients in Essiac tea, which is a common complementary cancer treatment. Combine 1 cup cold water and 1 to 2 teaspoons dried or 2 tablespoons fresh burdock root. Remove from heat and let stand an additional 10 minutes. Strain and store in a container with a tight lid. The decoction, if stored in a refrigerator, can be kept for up to about one week. Dosage: Add up to 1 teaspoon of the decoction per 10 pounds of body weight to your dog's food daily. 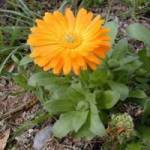 Calendula contains salicylic acid (also found in aspirin), which is pain relieving. It also has wonderful healing power due to its antimicrobial, antibacterial, antiviral, antifungal and astringent properties. The flowers of calendula (commonly called pot marigold) can be used to prepare herbal tea, tincture, poultice, salve, and ointment. Of course, you can always buy calendula salve and ointment online if you don't feel like making them yourself. Calendula is a "must-have" for our dog's herbal first-aid kit as it can be used for all types of open wounds. Internally, an infusion or tincture of calendula can be used for the treatment of inflammation or ulceration of the digestive or urinary tracts. If you want to try to make an all-purpose skin oil for your dog, this one is for you (adapted from Natural Remedies for Dogs and Cats by C.J. Puotinen). It can be used to heal burns, cuts, abrasions, other minor open wounds, and paw pad irritations (e.g. caused by de-icing salt in the winter). * Topical use for skin problems. We all know that chamomile tea has calming effects, and if you cannot sleep at night, a hot cup of chamomile tea may just be the thing that can lead you into slumberland. But did you know that chamomile benefits our dogs as well? The herb chamomile and its essential oil and hydrosol are very safe for use on dogs, although some dogs are allergic to the plant. Therefore, always check for sensitivity first before applying it to your dog. A strong infusion of chamomile has medicinal properties, such as antimicrobial, antiseptic, antispasmodic, and anti-inflammatory. It can be used to heal wounds, relieve pain, and calm an upset tummy. It is also sedative; therefore, it can be used to calm an anxious, nervous, or hyperactive dog. As this herb is safe and mild, it can be used as a sedative even for puppies to alleviate anxiety and other symptoms associated with anxiety, such as insomnia. The herb tea or tincture is useful for indigestion, gas, and vomiting. It's calming property is particularly helpful for cases of indigestive upset resulting from anxiety, nervousness and hyperactivity (Dosage: 1-3 teaspoon of the tea twice daily with food, 1-3 dropperfuls of the tincture twice daily with food, depending on your dog's size). A cooled chamomile infusion can be applied topically to soothe inflammed gums in dogs and relieve teething pain in puppies. Use a cotton swab to apply the infusion to the affected areas. A cooled infusion of chamomile is also an excellent topical rinse for the treatment of skin inflammations such as those caused by fleabites, contact allergies, hot spots, and various bacterial or fungal infections. This infusion is easy to make and can be used both internally to improve digestion, relieve stress and insomnia, and topically as a wound rinse and coat treatment. Add 1 cup hot water to 2 teaspoons of dried chamomile blossoms (or 2 tablespoons fresh). Cover and let stand 10-15 minutes or until cool. To help digestion, relieve insomnia, or alleviate stress, add the chamomile infusion to your dog's drinking water or food. You can also use this infusion to as a wash to clean debris from minor cuts and wounds, and as a rinse to improve coat and skin condition. Combine 1/4 teaspoon each of the dried herbs of chamomile, dandelion, and calendula. Add one cup of boiled water to the mixed herbs. Use this eye wash and drop into affected eye 2-4 times daily. Since this herb is rich in vitamins and minerals, dandelion benefits dogs by helping them to stay healthy. The herb can be fed to your dog on a regular basis as a tonic. Specifically, dandelion benefits the liver, skin, kidneys, urinary tract, as well as the digestive and circulatory systems. Simply dry the greens and crumble them onto your dog's food. Alternatively, make a leaf tea by boiling the greens in unsalted vegetable or meat broth. (Dosage: One teaspoon of dried herb for each 20 pounds of body weight.) You can also make a juice using dandelion and carrots (see below). This herb is also a strong but safe diuretic; therefore, it is beneficial to dogs with heart problems, which very often cause an accumulation of fluids throughout the body. The good thing of dandelion is, it is rich in potassium, which replenishes the precious mineral lost in the urine. 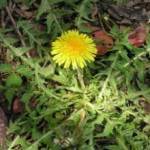 The diuretic property of dandelion also makes it an effective herb for dogs with bladder infections. It can help with an increase in urine flow, thereby flushing out and eliminating the bacteria that are causing the infection. To this end, treat an early bladder infection with dandelion and also Oregon grape (which is anti-bacterial). Give 1-3 drops of the tincture of dandelion and Oregon grapeorally to the dog, 5-6 times a day. Continue until the dog starts to have normal urine flow. Then reduce the dosage to once a day, 3 times a week for 3 weeks. The plant by itself is safe for dogs but make sure that the plants you use are free from herbicide. * Good for pain relief. I am sure many of us have already been using the herb echinacea when our immune systems need a boost, or when we feel that we are on the verge of catching a cold. But did you know that this herb is also very beneficial to our dogs? Echinacea is best known for its immune-boosting power, which comes from various constituents (e.g. flavonoids, essential oils, polysaccharides, and more) in the plant. All these constituents work synergistically and at different levels to help enhance immunity and support disease resistance in the body. In addition, echinacea also has anti-inflammatory and antimicrobial properties. Since echinacea is most effective in balancing the immune system and has a mild, direct effect against bacteria, viruses, and yeasts, it is therefore a good herb to use to fight against various infectious diseases, such as kennel cough, upper respiratory infections, urinary tract infections, and so on. However, the timing of administering the herb is important as its effectiveness depends on a relatively healthy immune system. Therefore, it has to be administered to your dog at the first onset of infectious symptoms, otherwise, the effect will be greatly compromised. If an infection has already set in, this herb can still be used in conjunction with other herbs, such as goldenseal, or Oregon grape. In addition, echinacea benefits dogs who have weak immune systems and are always susceptible to acute bacterial or viral infections. Immediately after exposure to an acute illness or at the first sign of an infection - For example, when the dog is exposed to kennel cough, or a communicable disease, or you feel that the dog is coming down with something. In these cases, give echinacea in large amounts (double or triple the usual dosages) for short periods of time (no more than 2 weeks). On a regular basis as an immune support - In this case, add small amounts of the herb to the dog's food once every 3-4 days. This herb does not taste good, so perhaps the easiest way to give the herb to dogs is to use a glycerine-based tincture. Mix the tincture well with the dog's food. Do not give gel capsules because dogs have shorter digestive tracts, so these capsules often pass through the GI tract undigested. Dosage depends on the needs and size of the dog, but a conservative rule is to give 12-25 drops of the tincture 3 times a day. As this herb stimulates immune functions and is complementary to a healthy immune system, it should not be used on dogs with abnormally functioning immune systems, such as those suffering from autoimmune diseases, leukemia, or diabetes. * Repels fleas & ticks. You may have heard of the health benefits of garlic for pets, but are not exactly sure whether it is really safe to give garlic to your dog because there is a lot of information and misinformation available on the internet about the use of garlic in food and supplements for dogs and cats. In this article, you will find well-researched information on garlic for dogs which I hope will help clear up some of the confusion you may have about garlic. Garlic Garlic has long been used as a safe medicinal plant in holistic medicine for people and pets as well. However, recently, the safety of garlic on dogs (and cats) has come under close scrutiny due to its properties as a member of the Allium genus, a branch of the lily family, along with onions and shallots. A compound found in onions (and in lesser amount in garlic) called n-propyldisulfide can, in large doses, cause oxidative damage to red blood cells, creating Heinz bodies and triggering the body to reject these cells from the bloodstream. If large doses of this compound are ingested on a regular basis, the process can lead to Heinz-body anemia and even death. Does that mean garlic is unsafe for dogs? Not quite. The key to safe use of garlic on dogs is the dosage level and frequency of use. For a dog to develop Heinz-body anemia, he would have to eat over 0.5% of his body weight in onions to even begin the oxidative process. It means a healthy 60-pound dog would have to eat a whole 5-oz onion, or several cloves of garlic, to start the Heinz-body process. Since red blood cells are constantly regenerated from the bone marrow, a dog would likely need to ingest this much amount of onion or garlic on a repeated basis to cause permanent harm. Garlic for Dogs - How Much and How Often? According to Gregory Tilford, (author of All You Ever Wanted to Know About Herbs for Pets), dogs can quite safely consume 1/8 teaspoon of garlic powder per pound of food 3 to 4 times a week. Dr. Martin Goldstein (author of The Nature of Animal Healing) recommends adding garlic to home-made pet food and he himself feeds garlic to his own cats and dogs on a regular basis. 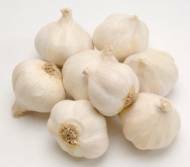 Dr. Messonnier (author of The Natural Vet's Guide to Preventing and Treating Cancer in Dogs) recommends one clove of fresh garlic per 10 to 30 pounds of weight a day to boost the immune system and cancer prevention. As with most herbs, at least one to two days off per week or a periodic week off from garlic is a good idea. Garlic has been used for thousands of years in Chinese and Ayurvedic medicine. It contains at least 30 compounds that have been found to be useful for a variety of conditions from skin disorders to cancer. In fact, holistic veterinarians have been recommending garlic for many years for its multiple health benefits. Garlic stimulates immune functions in the bloodstream by increasing the activities of killer cells (cells that seek out and destroy invading microbes and cancer cells). It is therefore beneficial for dogs with suppressed immune systems and dogs fighting cancer. Moderate garlic supplementation in the diets of even healthy dogs can boost their immunity and prevent cancer. Garlic is a powerful antimicrobial and antibiotic and is effective in fighting various forms of internal or external bacterial, viral, or fungal infection, including parasites (e.g. tapeworms) and protozoan organisms (e.g. giardia). Fresh garlic fed as part of a dog's diet can fight infections of the mouth, throat, respiratory tract, stomach, or intestines. Crushed garlic diluted in olive oil can be used as a topical antiseptic for minor injuries, ear infections, or ear mites. Garlic has detoxifying effects. At least six compounds contained in garlic can enhance liver function by helping the liver to eliminate toxins from the body, thereby preventing toxic accumulation that may lead to cancerous growths. Lowering Blood Cholesterol and Triglyceride Levels: Uncooked garlic mixed in with food helps to lower blood cholesterol and triglyceride levels in dogs, making it useful for certain breeds (e.g. miniature schnauzers, beagles) that are predisposed to hyperlipidemia, a condition in which the amount of fats (lipids) in the blood are elevated. A compound in garlic is effective at preventing blood clot formation in the vascular system. It can also reduce cholesterol levels and fat buildup in the arteries (atheorsclerosis). Therefore, it is an excellent cardiovascular tonic for older dogs. The exact reason and extent of garlic's effect on tick and flea prevention is not clear. It may be due to the odor released through the dog's skin as the compounds in garlic are metabolized. Whatever the reason, there are a lot of anecdotal reports on the effectiveness of garlic (especially in combination with brewer's yeast) as a tick/flea repellent. Which Form of Garlic Should We Use? Not all forms of garlic are the same - garlic that has been cooked under high heat (boiled, roasted, sauteed, etc.) is likely to lose its medicinal properties and a high percentage of its nutrients. Allicin, the compound in garlic that gives it the strong odor, is very unstable and dissipates quickly when exposed to air, moisture, or heat. However, it is also allicin that gives garlic its powerful antibiotic properties. Therefore, if you want to use garlic as an antibiotic, the best form is raw garlic or raw garlic juice (to be used within 3 hours of chopping or pressing). If you want to use garlic as a cancer preventive agent, immune-system enhancer, cardiovascular tonic, or nutritional supplement, other form of garlic (e.g. powder) should also give you the desired results. In addition, since garlic stimulates the immune system, people with lupus (which is an autoimmune disease) are advised not to eat garlic by The Johns Hopkins Lupus Center. Although I haven't found any reports or research on dogs with lupus and garlic consumption, I think it would NOT be a good idea to give garlic to dogs with lupus or other autoimmune diseases, since it would work in the same way in dogs as in humans (i.e. stimulate the dog's already over-active immune system). Ginger root, a common herb used in Asian cooking, contains at least 477 chemicals, including essential oils, beta-carotene, acetic acid, alpha-linolenic acid, ascorbic acid, camphor, capsaicin, and gingerols. Ginger is a catalyst herb - it is often added in small doses to many herbal teas and tinctures. Because of its stimulating properties, ginger is used to revive and enhance the function of various organ systems. Topically, it is used to stimulate blood flow and heat in the treated area. It increases circulation and sweating. Taken internally, the fresh root is sweat inducing and is therefore an excellent herb to dispel toxins through sweat. It is beneficial for dogs that are in poor health - with poor appetite; poor blood circulation; and a deep and slow pulse. The fresh root's antispasmodic property makes it a good herb for coughs, nausea, stomach pain, and lower back pain. If your dog suffers from motion sickness, ginger can be used to treat the problem (see below) by working as an anti-vomiting and anti-nausea agent. The dried root can alleviate digestive problems, such as diarrhea, colic, and flatulence. In addition, dried ginger root can be used as an herbal antioxidant and a tonic to enhance digestive health - it is especially beneficial to older dogs whose digestive systems are a bit sluggish. Just sprinkle some ginger powder on the dog's food. Used topically, ginger can be made into a poultice for the treatment of muscle pains and strains. The essential oil of ginger can be used to make arthritis massage oil blends. This versatile ginger glycerite can be used for different purposes. Used internally, it can prevent motion sickness or nausea, enhance digestion, and treat coughs. Used topically, it can be applied to minor burns and scalds after the skin has been cooled with cold water. Loosely fill a jar with chopped fresh ginger root. Fill the jar to the top with vegetable glycerine. Seal the jar and leave it in a warm room for at least 6 weeks, shaking it every few days. If your dog has motion sickness, give this glycerite to her about 20 minutes before getting on the car, preferably on an empty stomach. Recommended dosage is 1/2 teaspoon per 20 pounds of body weight. 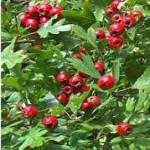 Hawthorn is best known as one of the safest herbs for the heart. It is commonly used as a cardiac tonic, as it increases blood circulation by dilating and relaxing the blood vessels, and enhances the transport of nutrients and oxygen throughout the body. This herb is also an antioxidant. It removes free radicals that take away oxygen from the blood. The good news is, hawthorn benefits dogs and is a safe herb for them. As mentioned above, hawthorn is an excellent and safe cardio-tonic. When used on dogs in small doses and over an extended period of time, it has been shown that it helps the body push more blood around the body, thus blood circulation is improved. Hawthorn also normalizes heart activity by strengthening a weak or erratic heartbeat and is therefore useful for dogs suffering from heart failure or weakness. In addition, for working dogs who are under cardiovascular stress on a regular basis, daily supplements of this herb can prevent heart failure in the long run. As you can see, it is beneficial to add this herb as a daily tonic to the diet of older dogs, especially those suffering from chronic heart problems (e.g. cardiac anomalies resulting from heartworm, or bacterial or viral infections). Not all herbs taste good, but hawthorn berries do! Most dogs like the sweet taste of the berries. If you have a hawthorn tree, the fresh, ripe berries can be given to your dog as a healthy treat. Tea can also be made from the berries which can then be poured onto your dog's food. Of course, you can always get alcohol-free hawthorne extract or capsules for your dog. If your dog has a heart problem and is on some kind of heart medication (e.g. Digitalis), hawthorn can be used in conjunction with the drug. Hawthorn is in fact safer and milder than conventional heart drugs and may even correct the undesirable side effects caused by the drugs. However, do check with a holistic vet for dosage and safe use of hawthorn if you want to combine this herb with heart medicines. The herb lemon balm (Melissa officinalis) has a distinctive lemon-mint fragrance and flavor, and is widely used as an ingredient in cosmetics and skin care products. However, did you know that lemon balm is also very useful medically? And did you know that it is so safe that it can be used on dogs as well? To make a lemon balm tea that is strong enough therapeutically, pour 1 cup of boiling water over 2 tablespoons of coarsely chopped fresh leaves (or 2 tablespoons dried herb per cup of water). As this herb is non-toxic and extremely safe, you don't have to worry about exact dosages or measurements too much. Freshly brewed lemon balm tea can also be used topically as a disinfecting rinse for minor cuts and other wounds. To make the rinse even more effective, add 2 teaspoons unrefined sea salt to each cup of tea and stir to dissolve. Simply pour the tea over the wound (be sure that the tea is not hot). As mentioned above, lemon balm has muscle-relaxing and antispasmodic properties. Therefore, it can be used to help ease some aches and pains in dogs caused by chronic conditions like arthritis, hip or elbow dysplasia, or old sports injuries. To this end, make a hot compress using lemon balm tea. The tea should be reasonably hot (but not scalding hot). Soak a wash cloth in the tea, wring just enough to stop dripping, then apply to the affected area and hold it in place for several minutes. Soak the compress again and reapply as needed to keep the area warm for 10 to 15 minutes. Since lemon balm is anti-viral and anti-bacterial, it is a good herb to use to make herbal honey, which can be used topically to dress wounds and treat skin infections, and orally to prevent bacterial or viral infections, help with indigestion, and generally boost the immune system. See this page for instructions to make herbal honey. * Good for skin problems. Since this herb is an effective anti-inflammatory due to the presence of Glycyrrhizin, which stimulates the adrenals, it is useful for treating Addison's disease in dogs. Due to its anti-inflammatory functions and corticosteroid-like actions, licorice is effective in helping relieve pain, itching, and inflammation without the side effects that can be brought on by corticosteroids. If your dog has arthritis, joint pain, or skin problems such as eczema, or atopic dermatitis, licorice is a good herb to use. The herb also acts on the digestive system by promoting cell growth and alleviating ulcers. Like slippery elm, it soothes and protects mucous membranes and is good for the gastrointestinal and upper respiratory tracts. For example, licorice benefits dogs with stomach ulcers, and the herb has long been used to alleviate coughs and ease discomfort brought on by bronchitis. Licorice is also beneficial in treating liver toxicity and preventing many forms of liver disease. In this regard, licorice has liver-protectant qualities similar to those of milk thistle. To treat or prevent any of the above ailments, the best way is to feed your dog a tincture of the herb. Because of its anti-inflammatory, antimicrobial and antiarthritic properties, you can also use this herb topically to help dogs with various skin problems, such as eczema, contact dermatitis, and flea allergies. To these ends, use an oil infusion of the herb. Extreme over-use or prolonged use of licorice may cause adverse side effects. If you intend to use licorice for over 2 weeks, consult a holistic vet. Licorice can raise sugar levels in blood and should be used with caution in diabetic dogs. Also do not use licorice for dogs with heart disease. In a glass jar, put some chopped dried licorice root and cover it with enough olive oil to leave a 1/2-inch layer of liquid above the herb. Put the jar in a warm place away from sunlight. Let it sit for one month. After a month, strain the oil through a sieve. The oil can keep for several months if refrigerated. Milk thistle is well known as a "liver herb" both for humans and pets. Milk thistle contains a flavonoid compound called "silymarin" which itself is a combination of several other active compounds. Extensive studies around the world have found that silymarin is safe and effective in treating a variety of liver diseases and other conditions, from kidney disease to mushroom or lead poisoning. It works by displacing toxins trying to bind to the liver and by causing the liver to regenerate more quickly. In addition, silymarin can work as an antioxidant for the liver - it scavenges free radicals and stabilize liver cell membranes. It also stimulates the production of new liver cells. Holistic veterinarians (and some conventional ones as well) have long been using milk thistle to treat dog liver disease. It has an excellent safety record and no known adverse drug interactions, although taking too much of the herb at a time can sometimes cause an upset stomach, gas, or mild diarrhea. Because of the powerful antioxidant properties of the silymarin compounds, milk thistle is an ideal herb for detoxification. In particular, dogs who have been on allopathic medications, dewormers, chemotherapy, vaccinations, and heartworm medications can benefit from milk thistle supplementation. It can also be given to dogs who are recovering from parvovirus. 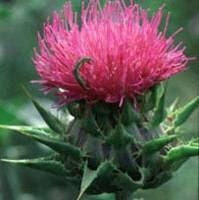 Dalmatian The standard dosage of milk thistle extract is based on a silymarin content of around 80 percent. Most supplements of milk thistle contain about 100 to 200 mg of the herb. As mentioned above, milk thistle is very safe on dogs. For dogs with advanced liver disease, a dosage as high as 200 mg per 10 pounds of body weight is possible. For other liver problems or health conditions, 75 to 100 mg per 10 pounds of body weight per day is sufficient to see results. If milk thistle causes upset stomach, gas, or mild diarrhea in your dogs, simply reduce the dosage. Despite the fact that milk thistle is hailed as "the" herb for the liver, it should NOT be given to healthy dogs as a daily supplement. Some studies show that long-term use of very high dosages of milk thistle will eventually suppress liver function. Milk thistle should therefore be used only as a medicinal herb for the treatment of liver disorders and other health problems as mentioned above. Additionally, silymarin is not recommended for use in pregnant women. It is probably a good idea not to use milk thistle in pregnant dogs until more information has become available. This milk thistle herbal tincture is glycerine-based (not alcohol based) so it is safe and easy to administer to dogs. Many dogs with liver problems have had excellent results after using this natural product. Mullein is a weed that can be found in much of North America. The leaves, flowers, and roots can be used to prepare tea, tincture, oil infusion, compress, poultice. This herb contains mainly mucilage and small amounts of saponins and tannins. As such, it has antimicrobial and antiviral properties, and it soothes and protects mucous membranes. It is expectorant and can suppress cough and treat asthma. The leaves of this herb are effective in easing coughs while reducing inflammation and increasing mucus protection in the bronchi. Combined with its antimicrobial and antiviral properties, mullein proves to be excellent in treating kennel cough and various other forms of respiratory distress in dogs and other animals. A glycerin tincture can be given directly into the mouth (1-2 ml. per 20 lbs of animal's weight, twice daily). Topically, the astringent and antimicrobial properties of the leaves are ideal for use treating minor wounds and insect bites. It speeds healing and is soothing to inflamed areas. Just mash up a few fresh or dried leaves with some water and apply the poultice to the affected area. The flowers, in the form of an oil infusion, also have antimicrobial properties and are effective in treating ear infections, including those caused by ear mites. Combined with garlic oil, which is also anti-bacterial and anti-viral, mullein garlic oil is a powerful healing oil for ear infections. The flower oil infusion can also be used to fight against fleas and mange. While this herb is safe for use on dogs and cats, it should be kept away from fish and amphibians since it is toxic to them. * Flea and pest repellent. 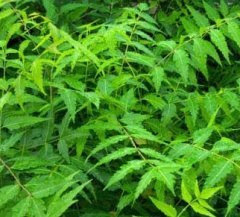 Neem Leaves Neem (Azadirachta indica) is a tree that grows in tropical places such as India, Africa, the Middle East, etc. It belongs to the Mahogany (Meliaceae) family. Neem oil is pressed from the seed kernels of the neem tree. The neem seeds are rich in oil and various compounds; therefore neem oil is considered to be the most powerful and concentrated "essence" of the neem tree. One compound that is of particular interest is azadirachtin, which has proven to be effective as a pesticide against about 300 insect species and, the good news is, it is non-toxic to humans and dogs. It works by interfering with the hormones of the pests, making them "confused", so they stop eating, mating, and reproducing! Another compound is salannin, which is also a powerful insect repellent that has been found to be more effective than DEET. There are different kinds of neem oil and not all of them are of the same quality. Be sure to get one that is organic, unrefined, and "cold pressed", since heat destroys the active compounds, making the oil less potent and effective. Neem leaves are rich in quercetin (a flavonoid), which has anti-inflammatory, anti-bacterial and anti-fungal properties. Neem leaves also contain compounds such as azadirachtin; therefore the leaves can be used to repel insects as well. Other compounds in neem are just as beneficial - They can relieve pain and reduce fever, and as such neem is often used to heal wounds such as cuts, burns, sprains, as well as arthritic pain. Recent studies have found that compounds in neem oil and leaf extract may have anti-cancerous properties. Some studies show that the compounds may be able to slow or stop cancer cells from growing. * Rinse for skin irritations. Nettle (aka stinging nettle) is nutritive - it is rich in protein, vitamins A, C, K, B complex, as well as minerals such as calcium, phosphorus, iron, magnesium, and potassium. It also has antibacterial, astringent and antihistamine properties. Due to its nutritive contents, this herb is an excellent herb tonic for your dog. It provides nutrients to the whole body without adding excess stress to the liver, kidneys and digestive system. Because of its high iron content, it is especially beneficial to dogs with anemia. It is also an energy booster for dogs who are weak and lethargic due to chronic fatigue. The herb nourishes the body and balances the liver, glands, and nervous system. The completely dried herb can safely be used long term as a tonic - just sprinkle it onto your dog's food (1/2 teaspoon/lb. of food fed to the dog). Nettle is also an antihistamine, and can therefore be useful for dogs with seasonal allergies. Daily supplement of nettle leaves may alleviate the allergic symptoms in dogs. Alternatively, use a tincture of the nettle leaf. Topically, the leaves of this herb can be made into a tea for use as a skin and coat rinse for your dog. It nourishes his coat and alleviates discomfort due to fleabites, eczema and other skin conditions. Internally, nettle leaf can also be given to dogs with skin conditions as it can cleanse and stimulate the blood and clear chronic skin ailments. Because of nettle's hemostatic property, the leaves can be made into a poultice for nosebleeds or other hemorrhagic conditions. When handling the fresh leaves of this herb, be sure to wear gloves since the leaves can cause a stinging sensation. Thorough drying or cooking neutralizes the toxic constituents that cause the sensation. This rinse (for dark-coated dogs only!) can improve your dog's hair and coat condition. Add 2-3 tablespoons dried nettle to 2 cups boiling water. After shampooing your dog, gently work the tea into the dog's coat, wetting the skin. * Helps dogs with UTIs. Parsley is nutritive and rich in protein, fiber, and vitamins (A, C, B1, B2, and K). In addition, it also contains trace minerals such as calcium, potassium, iron, magnesium, and phosphorus. The fact that parsley can freshen a dog's breath and can treat canine halitosis (bad breath) is well known. However, parsley benefits dogs more than just making their breath fresh. Parsley is antimicrobial and carminative. It is also anti-inflammatory and can therefore helps dogs with inflammatory issues such as arthritis and cancer. It is also a diuretic and can lower blood pressure. Below are some common uses of parsley to enhance dogs' health. Helps Dogs with Bad Breath: If your dog's breath is not so fresh and sweet, try sprinkling chopped fresh parsley on his food. Since the herb is antimicrobial, it is effective in preventing bacteria and other germs to multiply in the dog's mouth. You can also use parsley to make dog "fresh-breath" biscuits - see this recipe for example. Helps Dogs with Arthritis: Parsley root is excellent in treating dogs with arthritis. For this purpose, a tincture (1-2 ml/30 lbs of body weight) or a strong tea of the herb (see below) can be used. 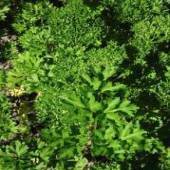 Helps Anemic Dogs: Since parsley leaves and stems are very nutritive, they can be used to treat dogs with anemia. Helps Dogs with Urinary Issues: The leaves also have antiseptic properties and are helpful in treating urinary tract infections. Since parsley is a diuretic, it is useful in boosting kidney function. In addition, parsley benefits dogs with heart problems because it helps stimulate the kidneys to eliminate the excess fluids in the lungs and/or other organs. Helps Dogs with GI Issues: Since parsley is a carminative herb, it strengthens intestinal muscles. It is therefore effective in treating colic and flatulent dyspepsia. Helps Older Dogs: A tea of parsley leaf can be added to our aging dogs' water to help strengthen the mucuous membranes in the urinary tract. Helps Dogs with Cancer: Parsley adds nutrients to a dog's diet, and it also has anti-cancerous properties as it has been found to inhibit cancer growth, it is therefore a good herb to use in a canine cancer diet. Add generous amounts of the herb to the dog's food. Helps Dogs Stung by Bees: If your dog has been stung by a bee, you can mash a handful of fresh parsley with a little bit of water and rub it on the bee sting. This remedy will not only eliminate some of the pain, but also will neutralize the poison. To feed parsley to your dog as a nutritive tonic, try to make juice out of fresh leaves by adding water to some fresh leaves and blend them in a blender or juicer. Feed the juice directly to your dog with an empty stomach or add to his drinking water. (1 teaspoon/20 lbs of the dog's body weight). Add 1 large bunch of fresh parsley to a pan with 1 quart of boiling water. Cover and let stand for 3-4 hours. Then return the covered pan to the stove and simmer over the lowest heat setting for 1 hour. You can freeze the tea in ice cube trays for long-term storage. Add 1 teaspoon/10 pounds body weight to your dog's dinner every day. The rose (Rosa spp.) is nutritive. Its leaves, petals, bark and stems have different degrees of astringency (the bark and stems offer the strongest astringency, followed by the leaves, then the petals). In addition, the rose is antibacterial. 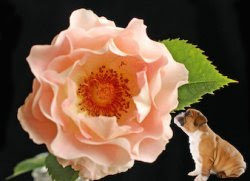 For dogs, different parts of the rose can be used to treat problems related to the skin and the digestive system. The most common way to obtain the therapeutic properties of roses is by making rose tea and rose vinegar. As is true for most herbs, rose tea (either using the petals or leaves) can be used both internally and topically. Cool strained tea with a pinch of sea salt added can be used as an anti-inflammatory eyewash. It is particularly effective in soothing itching or redness of the eyes as a result of air-borne irritants. Cool strained tea can also be used to treat minor wounds, such as cuts and abrasions. It can be poured directly onto the skin to clean the affected area or applied as a spray. Internally, rose petal tea can be used to tame an upset tummy. Specifically, it is often used to treat mild to moderate cases of colic and diarrhea. Just add the tea to the dog's drinking water (1 tablespoon per 20 pounds of body weight). Rose tea made from the leaves are stronger and can be used topically as a rinse for contact dermatitis, and skin inflammation and irritation caused by fleabites or fly bites. Rose leaf tea can be used internally for acute digestive tract inflammations caused by bacterial or parasitic infections. (1/2 teaspoon per 30 pounds of body weight, once to twice daily). However, the use should be limited to a maximum of four days. As mentioned above, the bark is the strongest and I recommend that the use be best left to holistic vets and herbalists. Rose vinegar (rose petals and apple cider vinegar) has disinfecting properties and is an effective treatment for small wounds and itchy skin. Apply it directly to affected areas as needed. It can also be used as a conditioner for your dog's coat - the apple cider vinegar works synergistically with the rose petals to soothe irritated skin and improve coat condition. To use as a coat conditioner, fill a plastic container with 1 cup of water, add 2 tablespoons of rose vinegar, shake to mix, pour it onto shampooed and rinsed hair. Massage gently so the vinegar can be evenly distributed over the hair. Let the coat air-dry, blot with a towel, or rinse with plain water as desired. Note: Because cider vinegar and red roses can stain or darken light hair, do not use this on dogs with light or white hair coats, or substitute ACV with white vinegar and red rose petals with lighter colored rose petals. The essential oil of rose also has therapeutic properties - it is good for itchy and dry skin; it also has a calming effect and is therefore useful for dogs with anxiety. It is also a natural tick repellent since ticks dislike its scent. However, 100% pure rose essential oil is very expensive, which can be a prohibiting factor for many of us to use the essential oil regularly on pets. Fortunately, we can always use the hydrosol of rose, which is far less expensive than the essential oil. Rose hydrosol can be sprayed full-strength on a dog's wet coat and then brushed or massaged in. This can soothe itchy and irritated skin, and can calm a nervous dog. As a tick repellent, it can be diluted with an equal part of water (a few drops of geranium essential oil can be added to the mix if you have it), and sprayed or applied to the coat as needed. Pour 1 cup of almost boiling water over 1 teaspoon dried or 1 tablespoon fresh organically grown rose buds or petals. Cover the container and let the tea steep for several minutes. The longer you let the tea brew, the stronger it is. To make a medicinal-strength tea, slightly increase the roses and let the tea steep until it has cooled to room temperature. Strain the tea through a piece of cheesecloth or coffee filter. Bring 2 tablespoons of chopped rose leaves to a boil in 2 cups of water in a covered pan. Simmer for 10 minutes, then remove from heat and let stand, still covered, until cool. Put dried organic rose petals in a clean, dry jar. Be sure to fill the jar only half way to allow for expansion. Heat raw organic apple cider vinegar to a warm (not hot) temperature. Pour the ACV into the jar to completely cover the petals with a margin of 2 or 3 inches. Seal the lid. Leave the jar in a warm place and let the rose petals soak for 4 to 6 weeks, or longer. Shake the bottle daily or turn the bottle upside down to let out trapped air. After 6 weeks or so, the vinegar will have absorbed the fragrance and medicinal properties of the rose petals. Strain the liquid and store the strained rose vinegar in a dark cobalt or amber glass bottle. Label it appropriately (with date and ingredients), and store away from heat and light. We can't talk about rose benefits without mentioning rose hips, can we? Rose hips are the round berries that develop after rose petals fall from their stems in late summer. They are rich in vitamins C and A, essential fatty acids, and antioxidants such as lycopene. They strengthen the immune system and prevent cancer. In Europe, rose hip powder is a popular supplement for arthritis patients. Although not clinically tested in dogs, rose hip powder has been used by many dog parents to help their arthritic dogs and the results are positive. * Topical use for skin infections. 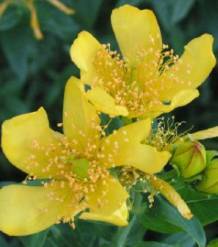 St John's wort contains compounds which include hypericin, essential oils, flavonoids, and tannins. Perhaps St John's wort is most well known for its antidepressant properties. This herb has been widely used to treat people with mild to moderate depressive disorders and the results are comparable to those of synthetic antidepressants. In addition, St John's wort is antiviral and antibacterial. Used topically and in oral tinctures, this herb has wound-healing functions. It has also been found that this herb can prevent tumor cell growth and induce tumor cell death. As this herb is most famous for its antidepressive property, both in humans and animals, St John's wort benefits dogs with anxiety disorders, such as separation anxiety, and agressive disorders. However, this herb has a lot more to offer in terms of holistic healing. Specifically, it is a good choice for the treatment of minor injuries such as bites and stings. It speeds up the healing process and at the same time reduces pain. For first aid purpose, a salve or tincture can be applied directly to the wound, or alternatively, the tincture can be fed internally. Thanks to its healing properties, St John's wort can also be used on dogs with arthritis - it can ease pain and speeds the healing process, especially of damaged nerves. Due to its antiviral property, the herb is also an excellent choice for treatment of various forms of viral infections. This skin oil is easy to make and is recommended for dogs with skin conditions, minor burns and cuts, paw pad irritations, and so on. Use any combination of the dried herbs of St John's wort, calendula, and comfrey. Put the herbs in a jar and cover the herbs with olive oil, filling the jar to the top. Seal the jar tightly and leave the jar in the hot summer sun for several weeks before straining. This herb is relatively safe except, in rare cases, some animals can develop a photosensitive rash from its use. The principal constituent of the bark of slippery elm bark is the mucilage, similar to that in mucilage-rich linseed. It is also rich in vitamins A, B complex, C, and K, protein, and minerals such as calcium, magnesium, and sodium. With all the buzz about turmeric in recent years, you most likely have heard about this herb or may even be using it for yourself and your family. The good news is, turmeric benefits dogs in numerous ways as well. Turmeric belongs to the ginger family and contains a mix of phenolics known as curcumin. It is the curcumin in turmeric that makes this herb so medicinally powerful. In addition, turmeric is high in vitamin B6 and minerals (manganese, iron, potassium) and contains a good source of fiber. Turmeric is a powerful antioxidant and has anti-inflammatory and antimicrobial properties. The anti-inflammatory effects of this herb are comparable to those of cortisone, and the antioxidant effects are comparable to those of vitamins C and E.
Turmeric also has liver supporting and protecting properties. It stimulates the output of bile (by as much as 100%!) and increases its solubility. In addition, it is a carminative, that is, it can help to prevent gas formation in the GI tract. As well, turmeric benefits the cardiovascular system: it can lower cholesterol levels and inhibit blood clots. In this regard, turmeric benefits people more because dogs do not commonly have cholesterol problems like people do. 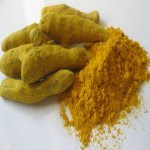 However, since turmeric has an affinity with the heart, dogs undergoing chemotherapy can benefit from the herb since it can protect the heart against damage by chemotherapy medications. A number of studies have suggested that turmeric can protect people against Alzheimer's disease. The curcumin in the herb triggers the production of an antioxidant that protects the brain against free radicals. Old dogs can also develop Alzheimer-like symptoms (canine cognitive dysfunction), and though no studies on dogs have been found, it does not hurt to add this herb to an old dog’s diet. Perhaps the most remarkable property of turmeric is its anticancer property. It has been found that turmeric has the ability to interfere in all steps of cancer formation: initiation, promotion and progression. To put it very simply: turmeric is able to cause cancer cells to end their lifecycle prematurely - in other words, it can cause the cancer cells to commit suicide! Inflammation Problems: Since it has antioxidant and anti-inflammatory properties, it is a good herb to use on dogs with chronic inflammation, such as skin problems, arthritis and joint pain. Liver Problems: If your dog has a mild liver problem, use turmeric to help protect his liver from deteriorating further faster. (If your dog’s liver symptoms are more severe, add milk thistle to the mix). Digestive Problems: Got a gassy dog? Add turmeric to his food and let the herb help decrease gas formation in the GI tract. Turmeric can also improve digestion because it stimulates the secretion of enzymes. Health Tonic: If your dog is old like mine, you may want to add turmeric to his food to help support his heart and as a general antioxidant to prevent cognitive dysfunction and cancer. Cancer: If your dog has unfortunately been diagnosed with cancer, then you should definitely add turmeric to his food daily to help fight cancer. The easiest way to give turmeric to dogs is to use the dried, powdered form of the herb (be sure to get an organic product such as this one). Small Dogs (10-20 pounds): ¼ teaspoon daily. Medium Dogs (20-50 pounds): ½ teaspoon daily. Large Dogs (50-100 pounds): 1 teaspoon daily. Dr. Randy Kidd (author of Herbal Dog Care) suggests that the simplest way is to sprinkle the dried herb on the dog’s food. As turmeric is fat soluble, it may be better to first mix the herb with an oil (e.g. olive oil or coconut oil), and add the herbal oil mix to the dog’s food. If you home-cook for your dog, you can also simply add the herb to the food during cooking. You can also use it to make dog treats. Here is a recipe. Dr. Dressler (author of Dog Cancer Survival Guide) suggests giving it between meals, at least 1 hour before or after food, on a totally empty stomach. Miniature breeds: 50 mg, 3 times daily. Small breeds (up to 35 lb): 100 mg, 3 times daily. 36-60 lb: 200 mg, 3 times daily. Over 60 lb: 250 mg, 3 times daily. Turmeric is a very safe herb for dogs, and there seems to be no toxicity reported at normal intake levels. Do not, however, overfeed it to your dog since large amounts may cause inflammation or ulceration of the stomach lining. Since turmeric has blood-thinning properties, do not use it 10-14 days before surgery. Also if your dog is on blood-thinning medications (e.g. warfarin), consult with your vet before giving turmeric to your dog. Research has found that turmeric can increase the risk of developing bladder stones since the herb is high in soluble oxalates. Turmeric, therefore, should not be used on dogs who are prone to the formation of oxalate bladder stones. If your dog has stomach ulcers, do not use this herb since, according to the University of Maryland Medical Center, there is some evidence that turmeric may increase stomach acid, making existing ulcers worse. If your dog is on anti-inflammatory drugs (e.g. NSAIDs or corticosteroids), consult with your vet before giving turmeric to the dog. As the herb also has anti-inflammatory properties, the dosage of the synthetic drug may have to be adjusted. Consult a vet first before giving turmeric to diabetic dogs. According to the University of Maryland Medical Center, turmeric may lower blood sugar levels and, when combined with medications for diabetes, could cause hypoglycemia (low blood sugar). If you have used turmeric before, you will know that the yellow pigment in the turmeric can stain light-colored surfaces. So don’t be surprised to see a yellow mustache on your white haired dog if you put turmeric on her food, and don’t let your dog eat on your white carpet!